This is a classic spicy Thai noodle dish. I luckily happened across a very good recipe for it at this excellent blog, also see the author's follow up post here. I've made pad khee mao from this recipe multiple times, the author got it right. It's not really difficult or complicated, the only problem is getting all the ingredients. 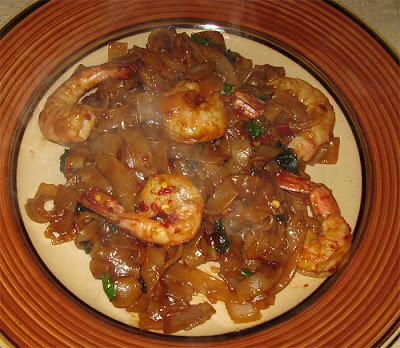 You'll have to go to an Asian grocery store to find some of these items, such as the Thai black soy sauce, the wide rice noodles, palm sugar, and the all important Thai basil which makes this dish pop. With that said, most of the ingredients have long shelf lives and can be used in a variety of other Thai or Chinese dishes. You can freeze the leftover basil. Note: like with all Thai food, it's all about the balance of salty, sweet, spicy, bitter, and sour. Try to follow the measurements as they balance very nicely in the end. 1) Prepare fresh ingredients. Combine ground pepper, rice vinegar, dried chili, lime juice, sugar, fish sauce, and tofu/other protein in a bowl. Marinade tofu in mixture while proceeding with further steps. 2) Soak sen-yai noodles in water for 15 mins. Place soaking noodles on the stove and bring to very slow boil, removing the noodles while they are still toothy. Drain immediately and with cold water to halt the cooking process. Set noodles aside. 3) Season wok with oil. Add the shallots, japapenos, garlic, and coriander stems to oil, frying briefly to make the oil aromatic. Stir fry your choice of vegetables and protein and the marinated tofu. Then add noodles and marinade. 4) Turn wok to high. As the noodle marinade/sauce begins to become reduced, add the Thai basil leaves, oyster sauce, and soy sauce. Just before serving, add the green onions and turn off heat. 5) Top noodles with freshly sliced jalapeno and coriander. Serve with a side of fresh cucumber to cool the tongue while eating. You'll need it!